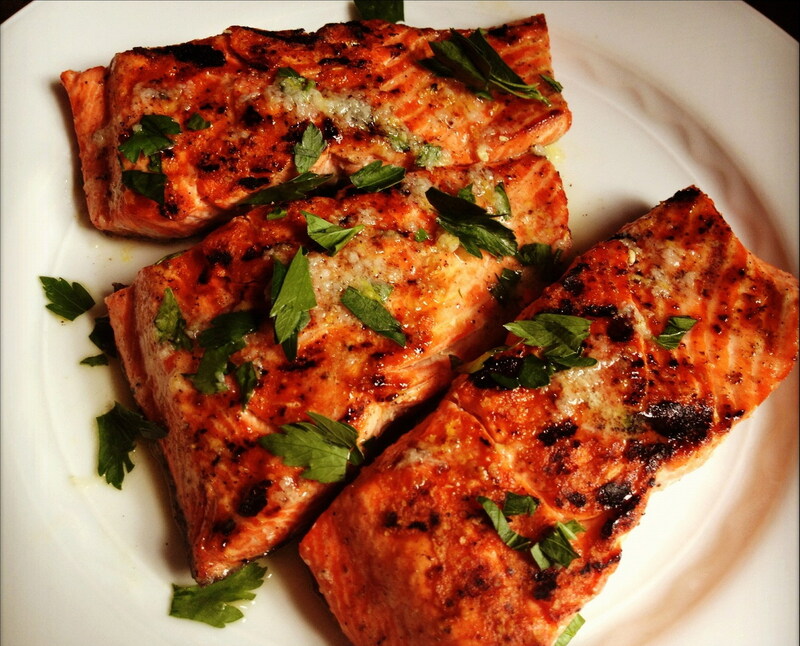 Grilled salmon with garlic lemon sauce. Photo courtesy of Liz Della Croce, The Lemon Bowl. Stumped by organic and natural food claims? Our green expert, Joyce Newman, takes the mystery out of often confusing (and sometimes deceptive) menus and product labels. Here, she dishes on ‘organic’ salmon. Sounds really delicious. So what’s wrong with these choices? The truth is there’s no such thing as “organic” salmon—seared, poached, or any other way—because the U.S. government has never set an organic standard for fish. So, until federal regulators decide to, what’s a fish lover to do? Look for wild-caught salmon, since it is believed to be a healthier choice than farmed salmon. “Wild-caught” means the fish are generally free of added growth hormones, antibiotics, pesticides, and other toxins. The best wild salmon is from Alaska and Pacific Northwest waters. In contrast, farmed salmon (and that includes most salmon sold in U.S. restaurants) is caught in the Atlantic Ocean or imported from Chile and Canada. It has been linked to several environmental and potential health hazards like water pollution, chemical use, parasites and disease. I asked the waiter at that eatery if the salmon items on the menu were wild-caught. After disappearing to the back for a few minutes, he returned to say the fish was, in fact, farmed salmon. If this sounds like an episode from “Portlandia,” you can relax. I didn’t question him further. I just ordered something else. Some restaurants will call their farmed salmon “sustainably-harvested” or “sustainably farmed.” This description may mean the salmon is raised in monitored pens or tanks in coastal water without antibiotics, pesticides or added growth hormones. The best farming practices use methods to prevent escape of the salmon into the wild. So menu items that say, “sustainably harvested” are actually worth considering. On seafood menus, you also can look for the blue and white certification seal from the Marine Stewardship Council (MSC), the leading authority for certifying sustainable fisheries. A growing number of restaurants that sell seafood meals display their stamp of approval (logo) on menus. Bottom line: the best choice at a restaurant is to order wild-caught salmon. If they don’t have it, consider shopping for it at your local market—it comes fresh, flash-frozen and canned. Come across any curious or questionable menus or labels? Please tell us in the comments below, e-mail our editor details or send them via Twitter at @gardadibble using #menusandlabels and we’ll investigate them for you. This entry was posted in Food, Uncategorized and tagged farmed salmon, healthy fish, healthy salmon, organic fish, organic salmon, salmon, wild caught salmon. Bookmark the permalink. Good post. Restaurants that serve wild-caught salmon are proud to do so, and will state “wild” or “wild-caught” right on the menu. If it says something else, it’s farmed. We avoid restaurants that market farmed salmon. It’s unsustainable, it harms wild salmon, and there is no good reason for any restaurant in the U.S. or Canada to sell the stuff. Wow. I wonder what was implied by “organic”, then. If it’s farm-raised, was it done without the pesticides, et al? If so, would that not be good? I’m confused.